They came in droves after the Revolution to see what this new nation had to offer, and not all of them left impressed. Virginia's bad roads were a common complaint, as were its rustic taverns and unsophisticated tavern-keepers. But few of this region's visitors from abroad could resist the "natural curiosities" first noted by Andrew Burnaby in 1775. Andrew Burnaby. Travels Through the Middle Settlements in North America, in the years 1759 and 1760; with Observations upon the State of the Colonies. London: Printed for T. Payne, 1775. McGregor Library. Although British minister Andrew Burnaby toured the middle colonies of North America in 1759 and 1760, his Travels remained unpublished until 1775, the eve of the American Revolution, when Burnaby hoped their appearance might help restore British and colonial American unity. Of particular note is Burnaby's list of "natural curiosities," the first published checklist of "must-see" stops for the enterprising traveler in Virginia. Most of Burnaby's curiosities were later described in greater detail by Thomas Jefferson, but the significance of Burnaby's achievement was not lost on David Hunter Strother, who reprinted Burnaby's checklist in his 1857 book, Virginia Illustrated. Marquis de Chastellux. Voyages de M. le Marquis de Chastellux dans l'Amérique Septentrionale ... v. 2 of 2 v. Paris: Chez Prault, 1786. Marquis de Chastellux. Voyages de M. le Marquis de Chastellux dans l'Amérique Septentrionale: dans les Années 1780, 1781 and 1782. Vol. 2 of 2 vols. Paris: Chez Prault, 1786. Shown: "Plan Géometral du Pont Naturel." A familiar figure among the Encyclopedists and philosophes of the French Enlightenment, the Marquis de Chastellux traveled to America as major general under Rochambeau in the summer of 1780, where he remained until returning to France in early 1783. Travels in North America is an account of Chastellux's travels between campaigns, including a journey through Virginia in April 1782. 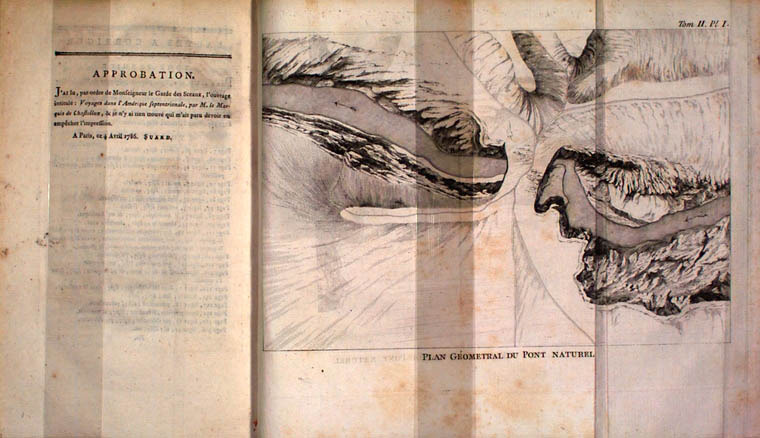 His "Plan Géometral du Pont Naturel" provides the earliest bird's eye perspective on what has now become a familiar landmark, the Natural Bridge. Thomas Anburey. Travels Through the Interior Parts of America. Vol. 2 of 2 vols. London: Printed for W. Lane, 1789. 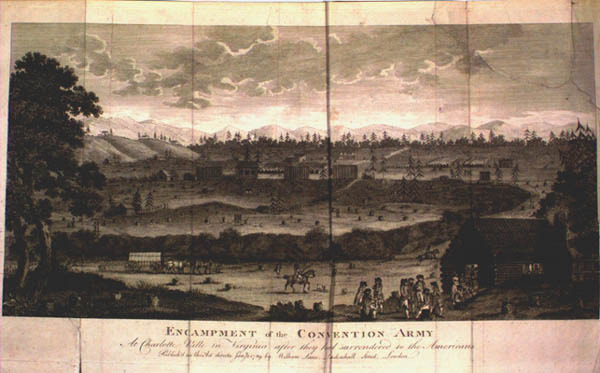 Shown: "Encampment of the Convention Army." Two aspects of Thomas Anburey's Travels set them apart from the reports of other visitors to Virginia: his imprisonment and his plagiarism. A lieutenant in the British Army, Anburey was imprisoned in Charlottesville from January 1779 through the fall of 1780, as the featured illustration suggests. In addition, although he no doubt witnessed most of the natural phenomena he reports, he nevertheless plagiarized large portions of his Travels from Andrew Burnaby, Peter Kalm, Abbé Raynal, and others. Ferdinand Marie Bayard. Voyage dans L'intérieur des Etats-Unis: á Bath, Winchester, dans la Vallee de Shenandoha etc. etc. etc. pendant l'été de 1791. Paris: Chez Cocheris, 1797. Frenchman Ferdinand Marie Bayard toured Virginia, Maryland, and Pennsylvania in the summer of 1791. As his title suggests, he traveled south from Baltimore through Bath, Winchester, the Shenandoah Valley, and the many other ("etc. etc. etc.") well-known sites of the day.